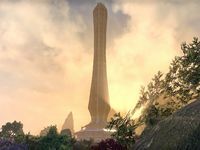 The Crystal Tower (also called the Crystal-Like-Law or Lawful Crystal) was an ancient, mystical structure located near the northern tip of Summerset Isle, northwest of Cloudrest. It was built by the early Aldmer as a monument to their ancestors, and was considered sacred to the Altmer. Before the construction of the Arcane University, it was the pinnacle of magical learning in Tamriel. The top of the Crystal Tower was reserved for interring the dead. The southernmost tips of the Dragon's Teeth Mountains of mainland Tamriel could be seen from the top parapet of the tower. The interior of the tower was white and radiated light. It contained a Great Library and a treasury with many ancient tapestries and other relics. The Crystal Tower was famed for its animal pens, which held many different creatures from all across Tamriel. The Crystal Tower was one of the mythical Towers that stabilize the Mundus. The Crystal Tower was present in all realms of the Aurbis simultaneously, acting as a gateway to all realities. The Tower's Stone was called Transparent Law, which was placed at the Tower's summit on Nirn. It has been theorized that control of the Crystal Tower—through Transparent Law—could grant one omnipresence in the entire Aurbis. In the early Second Era, the three Daedric Princes Clavicus Vile, Mephala and Nocturnal conceived a plot to steal the Heart of Transparent Law, making a deal with the Sea Sload K'Tora to make Iachesis—the leader of the Psijic Order—steal it using mind magic. Iachesis, however, managed to hide the Heart within himself. Circa 2E 583 the three Princes discovered this and killed Iachesis. However, Nocturnal betrayed the other Princes by taking the Heart for herself. She attempted to take control of the Crystal Tower by herself, but her plan was foiled by the Psijic Order and the Soulless One, assisted by the two betrayed Princes and a champion of Meridia. The divine power of Meridia's Dawnbreaker was then used to restore Transparent Law. I'ric Harad Egun was once the Archmagister of the tower. Tame trolls were employed as guards in the tower. During the Imperial Simulacrum, Jagar Tharn hid a piece of the fractured Staff of Chaos within the tower. The Eternal Champion located the tower by recovering a magical diamond from the Temple of the Mad God. The diamond was the source of power for the Mages Guild of Lillandril, and with the diamond the guild was able to locate the tower. The Eternal Champion entered the tower and recovered the piece of the Staff of Chaos. The tower was an early target for The Beautiful, but they failed to destroy it and moved on to easier targets. During the Oblivion Crisis (known to the Altmer as the Great Anguish), refugees fled to the Crystal Tower to fortify against the Daedra hordes. The Daedra broke through the refugees' defenses and used magic to topple the tower. During the construction of the Crystal Tower, the system of "inter-evocative hermetic harmonic resonance" was developed and persisted into the Second Era. This page was last modified on 24 December 2018, at 10:09.